Clover S54 replacement filter cartridge – 2-pack, offers the biggest saving on this world-class filter. The Clover S54 is manufactured by Everpure, a 49 year old USA base filter company that makes high-end commercial grade water filters. 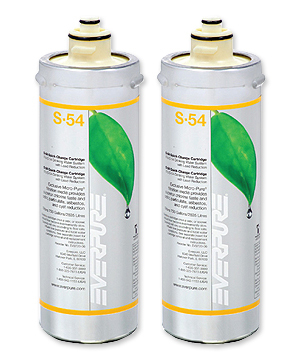 The Clover S54 is also known as the Everpure S54 water filter, and these two filters are identical. The Clover S54 fits a quick-change head, so changing filter is as easy as changing a light bulb. Learn more about the S54, Everpure®, technical specs, and what this filter removes from the water by clicking here for a downloadable PDF. ****If your Clover cooler already has this filter then you only need to replace the filter not the head. If you are buying a Clover unit for the first time then you would want to make sure you are also buying the head and install kit which you can purchase here.